The third of our four-part series on choosing the best lenses for your Canon EOS 5D Mk III concentrates on fixed focal length telephotos and super- zooms up to 300mm. Mounted to the 22.3 Mpix EOS 5D Mk III, we’ve assessed 26 different models covering various budgets from so-called ‘kit’ lenses to high-end telephotos. Read on to see which of those perform optimally and those that, if you’re in the process of buying perhaps, are best avoided. As we’ve already shown, the sensor in the Canon EOS 5D Mk III may not have the highest pixel count of the current crop of DSLRs, but fine detail resolution in images is a balancing act between sensor and lens. If the lens isn’t a particularly good performer then the extra you’ve paid for a camera with a higher pixel count may be squandered. From our tests, the full-frame 24x36mm sensor in the EOS 5D Mk III is very efficient, with a greater resolving power than any previous camera from the firm. When paired with the right lens it can achieve similar levels of sharpness as the overall leader in the DxOMark rankings, the 36Mpix Nikon D800. Our data shows that this is not an uncommon scenario – there are a large number of lenses that the Canon performs optimally with. We’ve tested the Canon EOS 5D Mk III with nine different 70-200mm models, six primes ranging from 150mm to 300mm, four super-zooms (including some “kit” options) and a further seven telephoto zooms. We’re always adding lenses to our database. Important / benchmark lenses, such as the Canon EF 70-200mm f4 USM non IS version, and EF 135mm f/2.0L USM and new Carl Zeiss APO Sonnar T* 2/135 ZE that we’ve not yet to test, will be added over the coming months. Our new lab in Seattle will also allow us to test lenses over 300mm in focal length. 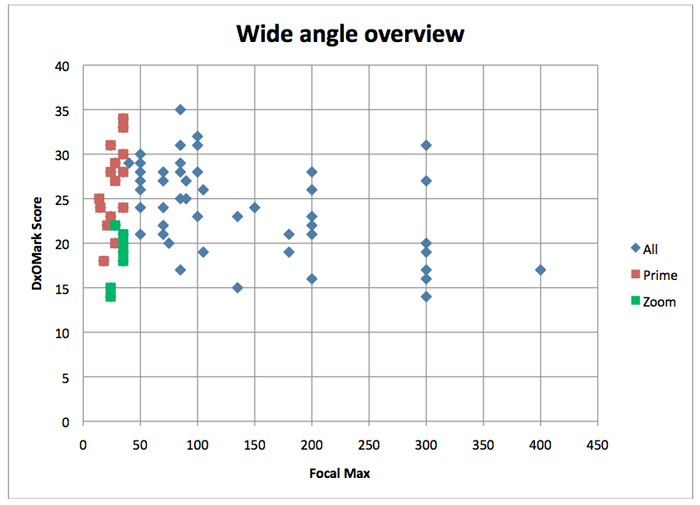 Fixed focal length lenses of 85mm and 105mm achieve the highest scores, followed by the ‘normal’ 40mm and 50mm lenses with zooms bringing up the rear. Zoom lenses are more difficult to design and correct for image degrading aberrations. In general terms, the 70-200mm telephoto lenses perform similarly to the “high end standard” zooms (detailed in Part II), while as a group the average scores were lower than the standard and short telephoto primes, as you would expect. 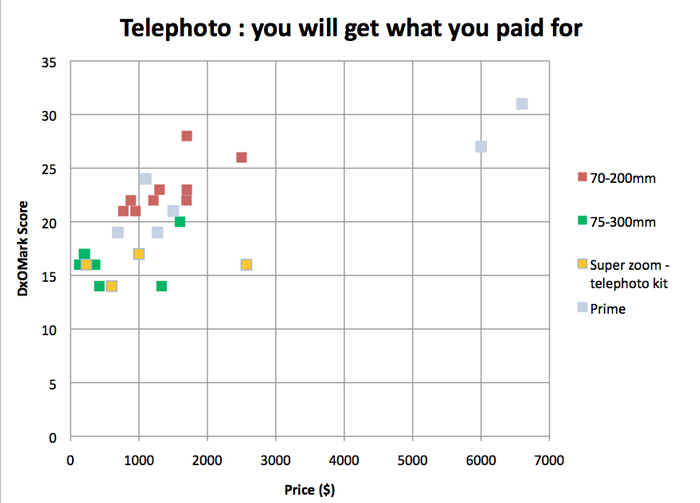 With lenses, like most things in life, you tend to get what you pay for. The more expensive they are, the better they perform. Canon’s top-pro EF 70-200mm f/2.8L IS II USM was upgraded to include fluorite glass usually a good indicator of image quality in Canon lenses but while it achieved a DxOMark Score of 27, it was beaten by an outsider – the Tamron SP 70-200mm f/2.8 Di VC USD with an overall score of 28. Canon’s highly regarded EF 70-200mm f/4L IS USM also performed well (coming joint fifth) but lost out to the older (1995) non IS f/2.8 version and the new Sigma 70-200mm f/2.8 EX DG OS HSM. None of these lenses are cheap but the older (2008) Tamron SP AF 70-200mm f/2.8 Di LD IF Macro is worthy of consideration if budget is tight, provided that it can still be found on dealers’ shelves. One point to bear in mind is that we’ve yet to test the Canon EF 70-200mm f/4L USM non-IS version. At around $710, this is small and light zoom is a very popular model and has a good reputation for high quality imaging (both this and the IS version use fluorite in the optical construction). Becoming increasingly popular with enthusiasts and professionals alike, the 70-300mm offers more reach than the 70-200mm but at the expense of a variable aperture of one to two stops over the range of focal lengths compared to the f/2.8 models. Image quality is generally very good, especially with newer models though they’re not quite in the same league. Those shortcomings have to be weighed against advantages such as image stabilization, lighter weight, smaller size, where relevant, as well as a generally lower price. 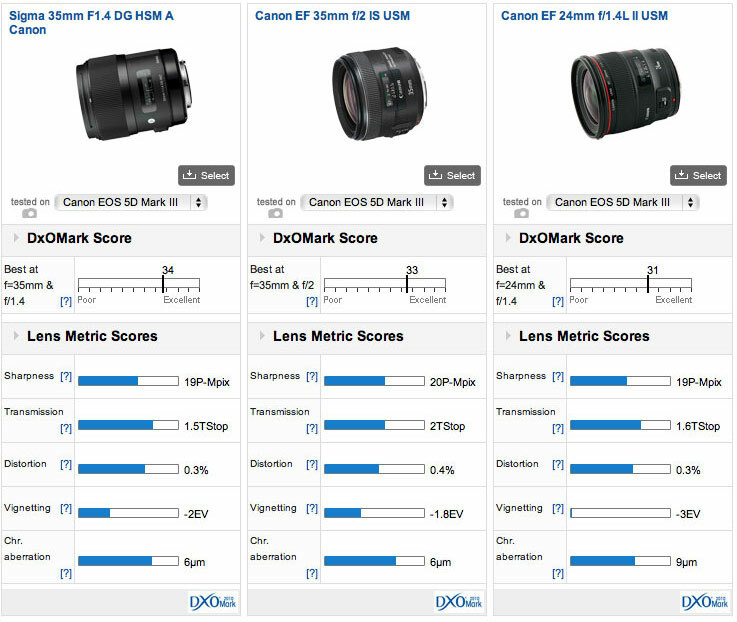 No real surprises here the Canon is a new addition the firm’s L-series range, and it achieves good scores. Despite the APO designation, the Sigma only just manages to achieve a one-point lead over the Tamron. Canon’s newish EF 70-300mm f/4-5.6L USM competes head-on against several of its own models including the four 70-200mm in the range and three further 70/75-300mms. It has the best image quality of the latter group, shrugging off much cheaper options from Sigma and Tamron. 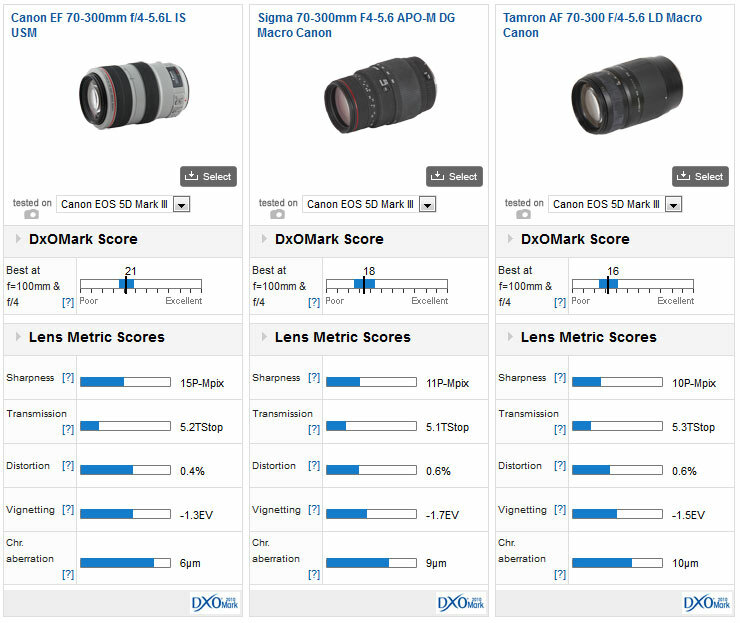 If buying on a budget, the dearer of the two Sigma lenses, the 70-300mm f/4-5.6 DG OS, may be the better choice as it has image stabilization and differs only by one point in our DxOMark score. Bear in mind it lacks an ultrasonic motor for AF, but it is quite small (76.5mm X 126mm / 3.0 x 5.0 in) and light in weight at 610g/21.5oz. Newer lenses of equal specification nearly always outperform older lenses, and nowhere is that more noticeable than those with high zoom-ratios, or “super-zooms”. These are rightly popular due to their versatility, but there are downsides. Image quality is the lowest of those tested and their variable maximum apertures are ‘slow’; f/5.6 at the long end is typical and f/6.3 not un-common. The Sigma 120-400mm lens has the highest DxOMark Score of those tested, but the lens that stands out here is the Canon EF 28-300mm f/3.5-5.6L IS USM. That lens has a zoom ratio of approximately 11x compared to just 3.3x for the Sigma. However, the overall quality including a durable pro-level construction is reflected in the price, and at nearly $2,600 it’s really only going to appeal to a small number of individuals or photo agencies. At $630, Tamron’s diminutive AF 28-300mm f/3.5-6.3 XR Di VC LD may lack the performance of an ultrasonic AF motor but it has stabilization and lens coatings optimized for digital sensors. The models with ‘fast’ maximum apertures are intended for sports and action photographers. They carry a huge price premium for a one-stop advantage but, from our tests, they do stand out for their imaging performance. While this is good news for those that have invested in these models, they have limited demand. We’ve also yet to test any Canon super-telephoto lens longer than 300mm, though when we do we will update this review with the info. Single focal length telephotos are capable of high quality imagery and some of the prices in this category point indicate that was at the forefront of the maker’s design criteria. It’s not really unexpected, then, that the new $6,600 Canon EF 300mm f/2.8L IIS II USM with its unusual yet promising double fluorite element design is the highest performing lens of the six models tested. 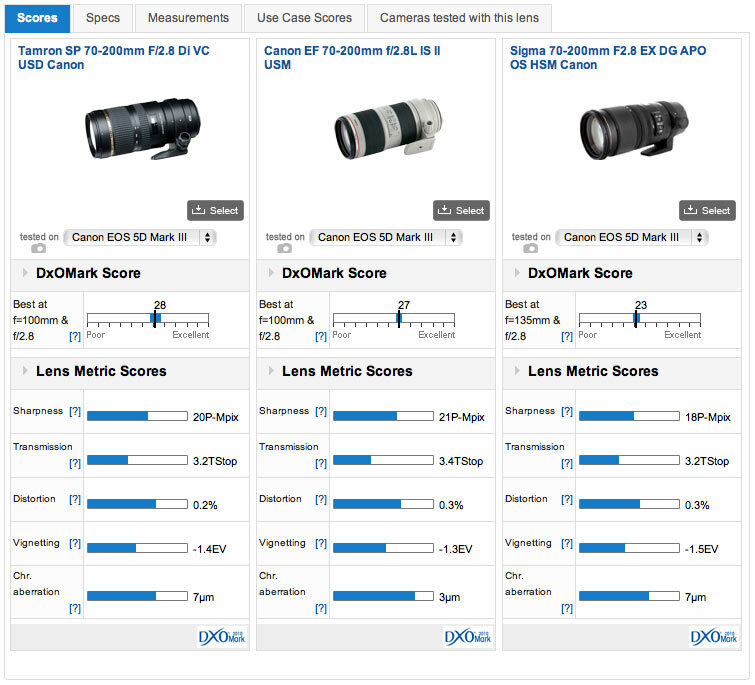 It comfortably out-performs the older version with a four-point advantage in our DxOMark score. The new lens has higher levels of sharpness, better transmission and no discernible distortion. The only slight setback is a very slight increase in chromatic aberration. Interestingly, for photographers looking for recommendations on tele-macro lenses, the Sigma APO Macro 150mm f/2.8 EX DG OS HSM scores 3 points more than the Canon EF 180mm f/3.5L Macro USM with a DxOMark score of 24 versus 22 for the older film–era Canon lens. There’s no getting away from the fact that zooms are more versatile, and for many users the telephoto zoom is a more practical choice. On the Canon EOS 5D MK III the best option are the 70-200mm models. These lenses are a corner stone of a maker’s range and there’s a wealth of experience in optical and mechanical design. While other high-ratio zooms offer more flexibility, with fewer compromises made the 70-200mm models offer excellent all-round image quality and sharpness. The best models are even capable of surpassing dedicated macros, though they’ll not share the same capabilities at short distances. If you’ve $6600 to spare, and want the best lens for sports, the new EF 300mm f/2.8L IS II USM is the sharpest telephoto lens we’ve tested. In part IV, the final section of this series, we’ll look at wide-angle zooms and primes available in Canon EF mount. The last in our four-part series on choosing the best lenses for your Canon EOS 5D Mk III concentrates on wide-angle zooms and primes. Mounted on the 22.3 Mpix EOS 5D Mk III, we’ve tested 23 different models covering moderately wide- to ultra-wide angle lenses ranging from 35mm to 12mm. 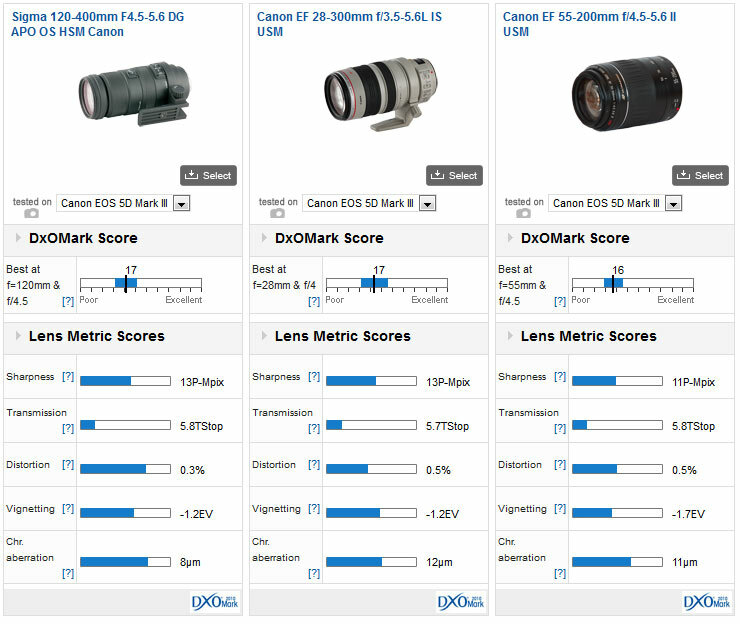 Read on to see which of these perform best on the EOS 5D Mk III. With their expansive, rectilinear perspective and generous depth of field, wide and ultra-wide angle lenses are ideal for panoramic landscapes, architecture and interiors. They’re also particularly suited to creative use. With subjects close to the lens being exaggerated in size, ultra-wides can be used to create striking images with an almost three-dimensional quality that can’t be achieved with longer focal length lenses. Wide-angle lenses, are typically those with a focal length ranging from 24mm to 35mm and encompass an diagonal angle of view ranging from 84-62 degrees (74-to 54-degrees horizontally) on a 35mm format camera. In terms of popularity, the 24mm is well-liked, especially with today’s high resolution sensors, where light cropping can achieve the same coverage as a 28mm. As a result, 28mm lenses tend to be offered with a slightly lower technical specification (and price) to differentiate the two, and could make a tempting proposition to those on a budget. 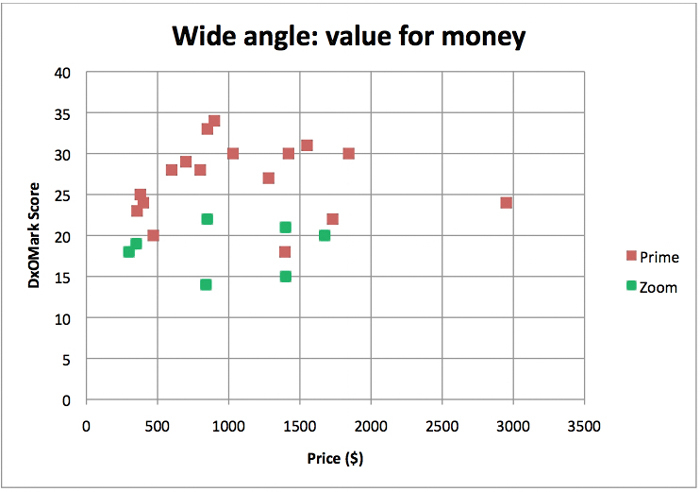 Although most makers refer to the diagonal angle of view in their product literature, most purists prefer to think of the coverage of wide-and ultra-angle lenses in terms of the horizontal angle of view. This is because as photographers, we naturally assess a landscape or interior across the frame, from left to right. As a group, ultra-wide angle lenses for 35mm (full frame) format cameras have a focal length less than 24mm and project a rectilinear image, rendering straight lines as straight lines. Fish-eye lenses have short focal lengths as well, but produce circular images with strong barrel distortion. Typically today, the range of focal lengths include those ranging from 12mm to 21mm, and provide sweeping images with an horizontal angle of view of around 113- to 81-degrees, respectively. We’ve tested 23 different models covering moderately wide- to ultra-wide angle lenses ranging from 35mm to 12mm, including zooms as well as primes. Some of the more significant lenses we’ve not yet been able to test include the Canon EF17-40mm f/4L USM, and the EF14mm f/2.8L II USM. 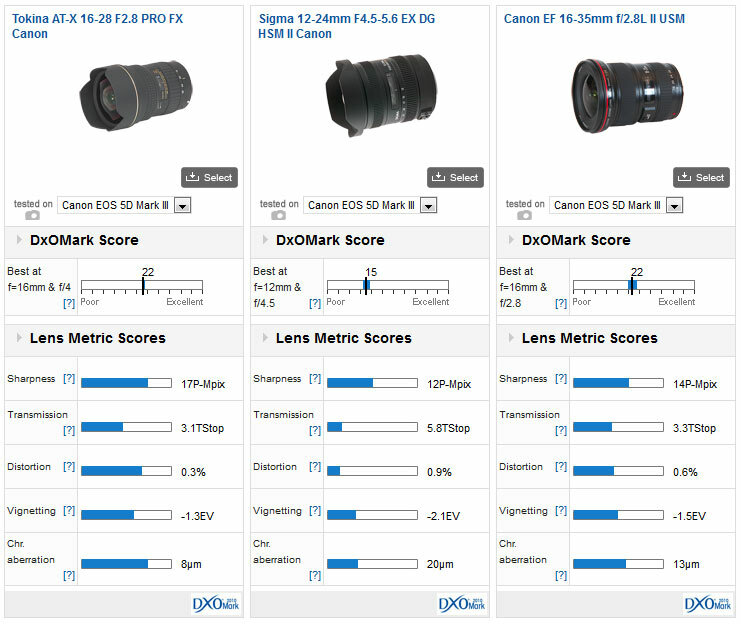 Fixed focal length wide-angle primes out-perform their zoom counterparts and achieve comparatively good scores against the rest. If we compare wide-angles as a whole with the complete database of lenses tested on the Canon EOS 5D Mk III, the primes perform well, with some of the best examples approaching that of the best standard focal lengths and short telephoto lenses. Inevitably, some compromises are made during the design process. Correcting for stronger distortion and vignetting at shorter focal lengths take their toll on sharpness across the frame and make high image quality a challenging proposition. Lenses that perform uniformly well in all areas tend to cost a lot more than those that achieve good results in a few of the metrics. 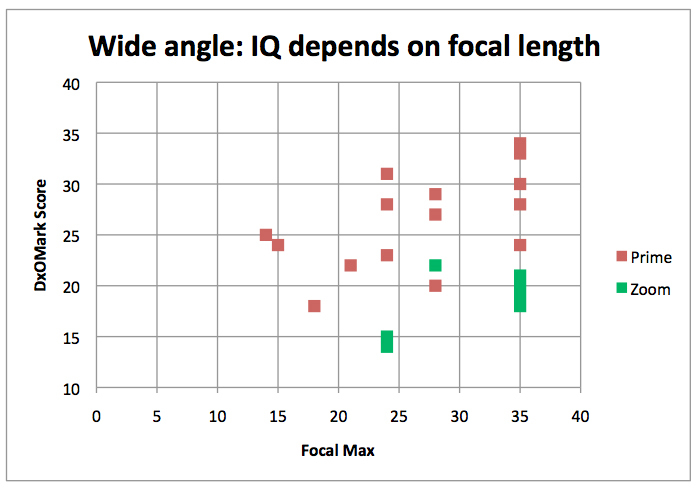 It’s quite clear from the list that wider lenses perform less well than the more moderate focal lengths, though the exception to this are the older film-era lenses which were never designed with the high-resolution digital sensor in mind. It comes as little surprise to see the recently tested, high-scoring $899 Sigma 35mm f/1.4 DG HSM (A012) occupy the number one position. Moderate wide-angle lenses are only moderately more difficult to correct than standard lenses, and the Sigma is the highest performing wide-angle we’ve seen to date. It is, however, given a close run by the new $849 Canon EF 35mm f/2 IS USM. On the Canon EOS 5D MK III it even has higher sharpness at 20P-Mpix. It’ has excellent Transmission and similarly low levels of Distortion, and Chromatic Aberration. Although it has image stabilization, it has one downside in that the price is very close to the ‘faster’ Sigma. Canon’s highly regarded EF 24mm f/1.4L II USM has a similar performance though the slightly higher Chromatic Aberration and -3EV vignetting pull the overall DxOMark score down a couple of points. Also worthy of a mention is the redesigned Canon EF 28mm f/2.8 IS USM. At $699 it’s good value for money, given the optical performance. Of the ultra-wide angle lenses tested, the Samyang 14mm f/2.8 IF ED UMC Aspherical achieves the highest DxOMark score and yet costs a relatively affordable $599. Distortion is high, as is Chromatic Aberration and Vignetting, but it has higher uniformity of sharpness across the image field over the first three stops. The Zeiss Distagon T* 2,8/15 is sharper overall with better control of distortion but you will have to pay for the privilege. If those are too wide (they have a 104 and 100-degree horizontal field of view, respectively) the Zeiss Distagon T 2,8/21 (21mmm f/2.8) fares well with a DxOMark score of 20, and has both low Chromatic Aberration and Distortion. The only real shortcoming is the Sharpness score, which at 13P-Mpix, appears to be on the low-side for a prime. 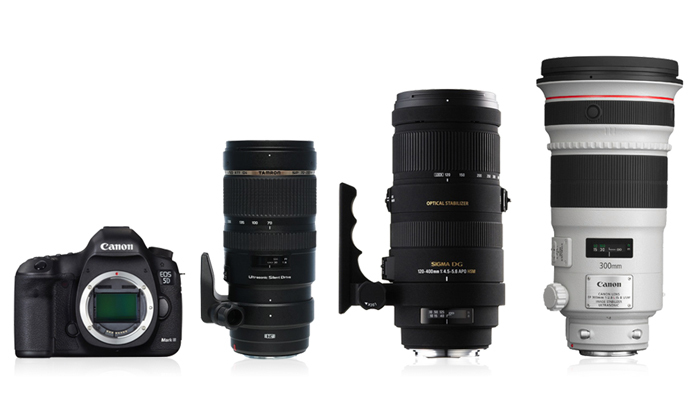 Zoom lenses dominate the ultra-wide category just as they do in every other. They’re so versatile they more or less made the old film-era f/2.8 prime lenses redundant. Nonetheless, while Canon is breathing new life back into those models with image stabilization and top-drawer optical designs, the zooms still look attractive in terms of portability and convenience. High-speed, wide-angle zooms dominate two of the top-three positions in our DxOMark comparison mounted on the Canon EOS 5D Mk III . Tokina prudently limited the focal range of the AT-X 16-28mm f/2.8 Pro FX in order to maintain image quality, and in doing so has achieved a relatively high DxOMark score of 22, as well as a high individual scores for Sharpness, Distortion and Chromatic Aberration. It’s the highest scoring wide-angle zoom in our database currently (tie with the Canon EF16-35mm f/2.8L II USM), but it’s also one of the newest designs. The Canon EF16-35mm f/2.8L II USM and its predecessor (not shown for comparison as it’s no longer available new) take first and third place despite their high price. Both are designed for daily pro-use and the current version has good Sharpness but high levels of Chromatic Aberration are disappointing. As the widest of its type currently available, Sigma’s unique full-frame 12-24mm f/4.5-5.6 zoom is certainly noteworthy. At $1400, it not cheap but the horizontal field of view at 12mm is an incredible 112-degrees, while still attaining a respectable DxOMark score of 15. Given the angle of view, it has low levels of distortion and reasonable Sharpness at 12P-Mpix. There are numerous wide-and ultra-wide options for the Canon EOS 5D Mk III but if resolution and contrast are to be maintained, then it should be no surprise to hear that a prime lens should be chosen over a zoom. That said, the widest, and one of the most versatile lenses of the group is the Sigma 12-24mm f/4.5-5.6 II DG HSM. It certainly pays to consider third-party options. Samyang and Zeiss offer some of the highest quality imagery in this category while the Sigma 35mm f/1.4 DG HSM A is highest performing lens of the group. Canon users shouldn’t feel disheartened though, the numerous high-speed L-series all offer high image quality. The firm’s new IS enabled primes offer similar levels of imaging performance with the added advantage of stabilization, a feature that’s not only useful for stills but increasingly important for video as well. 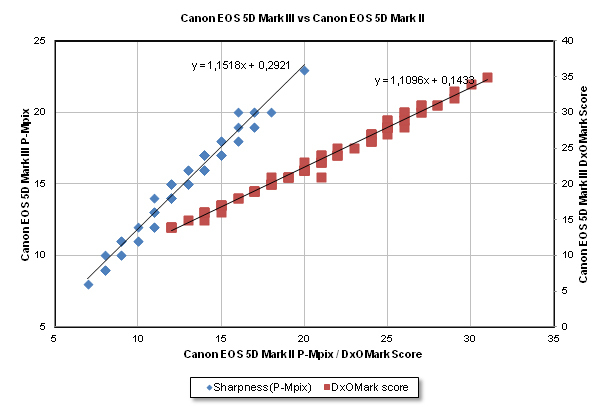 Part I: Canon EOS 5D Mark III vs. Nikon D800: Competition is closer than expected! 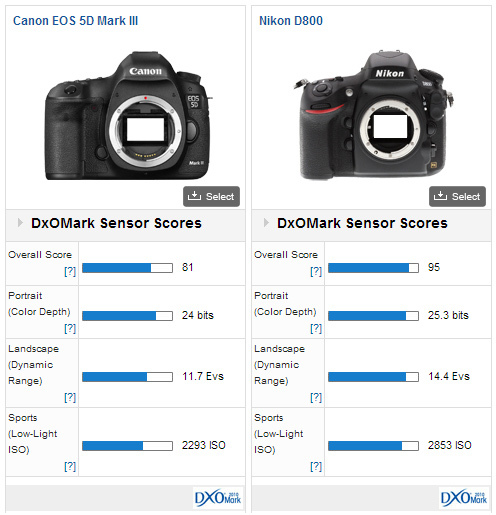 While it comes as no surprise to see the Nikon D800 grab first positions in the Top 10 DxOMark camera/lens combination scores, the Canon EOS 5D Mark III ranks second, just ahead of the 24 Mpix Nikon D3X. More surprises await when we compare the Sharpness scores between the two camera brands, where the Canon EOS 5D Mark III occupies no less than 3 positions out of the Top 10. 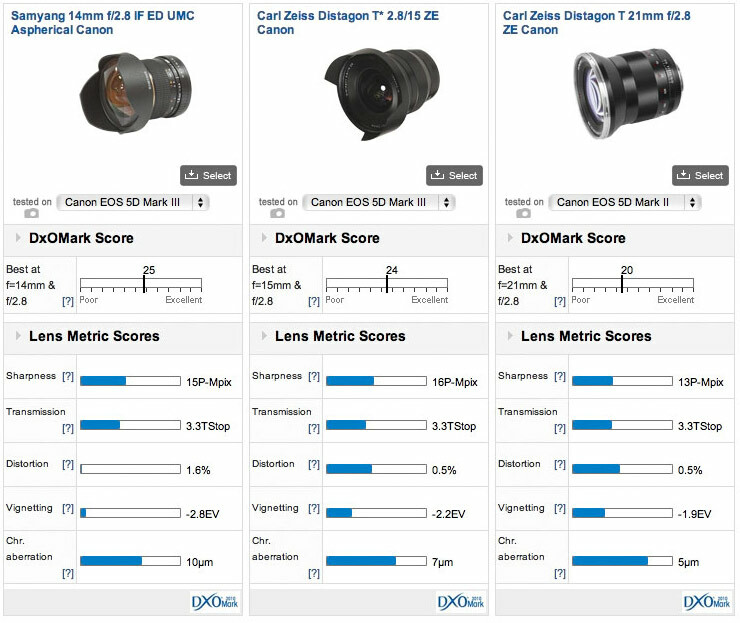 Out of a total 147 lenses tested, the Canon surprisingly delivered a higher mean sharpness than the Nikon D800, although it matched the median sharpness and was bettered in the DxO Mark scores overall. When using specific lenses (such as the new Sigma 35mm f/1.4 DG HSM A) the Nikon can out resolve the Canon. 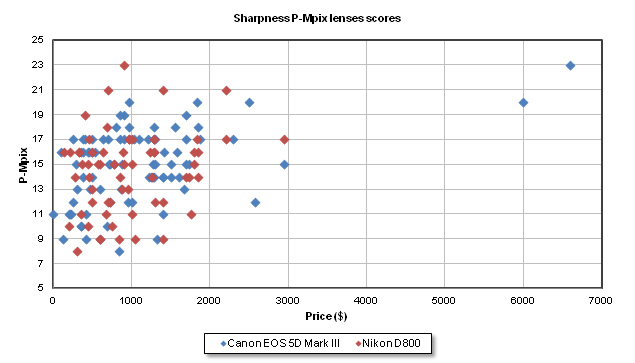 However, taken as a whole, the statistics reveal the EOS 5D MK III is capable of similar sharpness and of achieving a close DxOMark camera/lens score to the Nikon D800. Moreover, that’s despite the latter camera’s 60% extra pixel count. 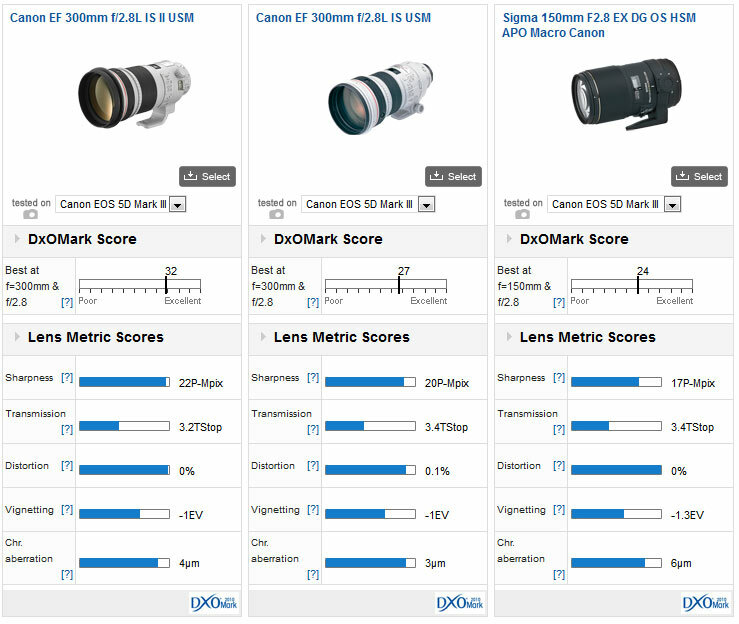 Even the DxOMark mean and median scores can be explained by the small difference (-1/3 stop) in the Low Light ISO score between the cameras. 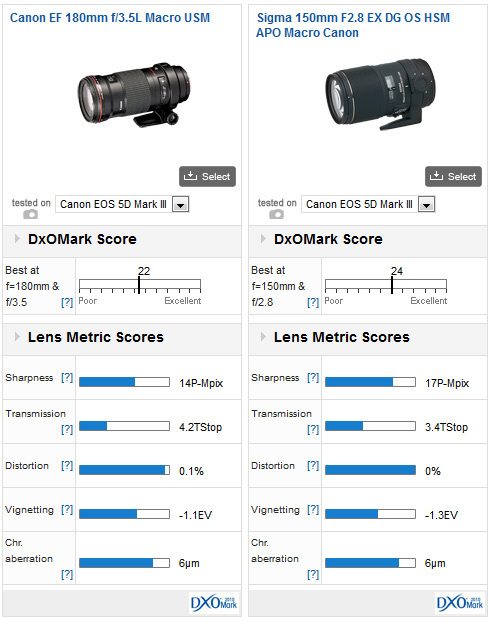 A small (1/3 stop) difference in the Low Light ISO score between the cameras accounts for lower median and mean DxO Mark camera / lens scores. While the Nikon D800 is capable of getting the best from any lens that’s fitted, it is essential to select lenses specifically to maximise the potential resolution of the sensor. If you’re trading in a Nikon D3X, for example, you may want to confirm that your existing lenses are capable of meeting (or maybe even exceeding) your expectations. While that same principle of choosing the best glass also applies to the Canon, it’s not quite as crucial. In financial terms alone, this may be an important consideration if you have already invested in a sizeable range of lenses. Lenses on the Canon EOS 5D Mark III are without doubt very efficient. 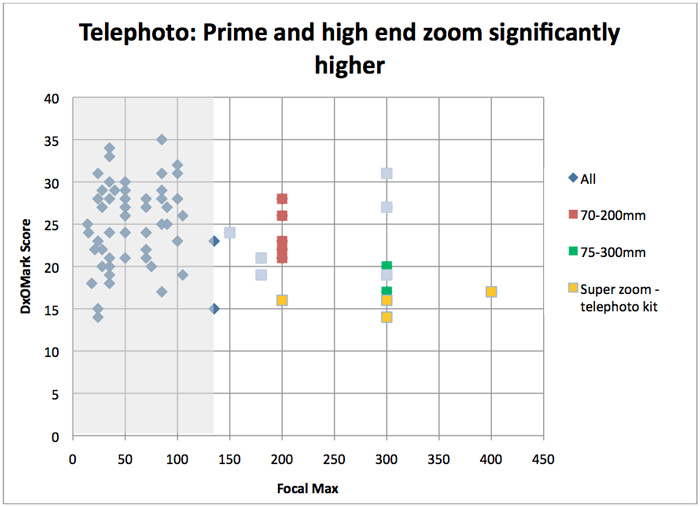 In future tests, it will be interesting to see if the Sony sourced sensor in the Nikon D800E variant with its altered (zero strength) OLPF (Optical Low-Pass Filter) is significantly more efficient at resolving detail or if it’s as a result of the differences in fill-factor (affected by RGB filter transmission, micro-lens design and circuitry) between the Canon and Nikon sensors. 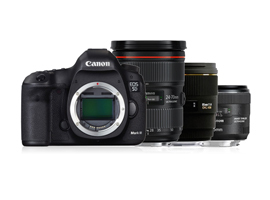 With only a 6-percent increase in pixel count, the Canon EOS 5D Mk III averages an increase of 15% in our Sharpness (P-Mpix) scores over the earlier EOS 5D Mk II (based on the 85 lenses in our database). Although the Canon EOS 5D Mark III has a different sensor with a slightly increased pixel count of 22.3 Mpix, against the EOS 5D Mk II’s 21.03 Mpix, the new Mark III can boast an average increase in Sharpness (P-MPix) of 15% over the earlier Mark II model (based on the measurement data from the 85 lenses tested). Canon hasn’t simply delivered a sensor with a minor increase in pixel count; they’ve significantly re-worked the architecture to provide an increase in sharpness. Studio and landscape photographers looking for advice may also be interested to know the new EOS 5D Mark III has improved sharpness, lens-to-lens, than the older, now discontinued 21.1 Mpix Canon EOS 1Ds Mark III. Given the somewhat lowly-looking pixel count of the Canon EOS 5D Mark III the potential sharpness is, surprisingly, one feature where the camera exceeds expectations. Providing the camera is matched to specific lens models, sharpness can even exceed the Nikon D800 under certain circumstances (when that camera is used with lesser capable lenses). This is great news if you’re looking to invest in one or own one already. If you’re a Canon user and are looking to upgrade, or maybe even switch because of the sensor’s perceived lowly capabilities then this should put your mind at rest. Please look out for next part of this review, where we’ll look at the finer points of the results for camera and lens combinations to choose from and those lenses that you may want to avoid.